Boston police arrested a suspect at gunpoint after multiple shots and explosions were heard in the suburb of Watertown on Friday morning – hours after a MIT campus police officer was shot dead late on Thursday night. Dozens of police officers, FBI agents, national guard, K-9 units and SWAT teams rushed to Watertown after midnight after a reported car chase involving two suspects in a black 2013 Mercedes. Witnesses reported hearing explosions and gunfire as the police engaged the two men and local television footage showed one man lying spread out on the ground, with his arms out, surrounded by police. One suspect is reportedly in custody and another has been taken to Beth Israel hospital in Boston – their injuries are not clear. 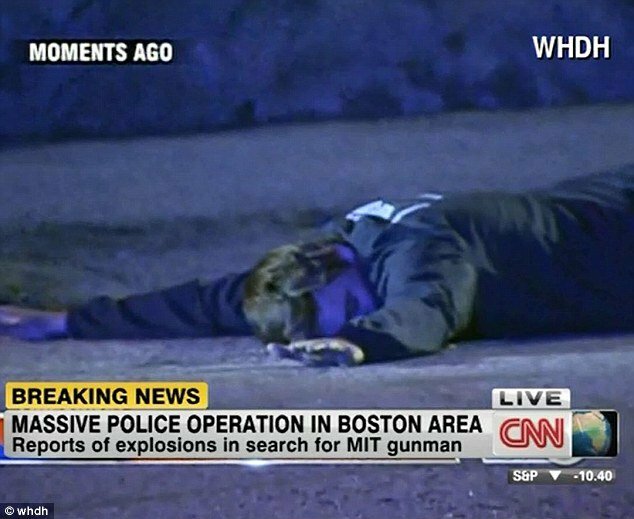 It is not clear at this time if the Watertown engagement, the MIT shooting and the Boston Marathon bombings are connected. As the battle raged, police urged everyone to stay inside of their homes. The area is still considered extremely dangerous. Law enforcement were reportedly searching for a black 2013 black Mercedes vehicle which a suspect is driving. Initial reports suggest that one suspect is in custody and a police officer has been injured. Earlier – Boston suburbs Cambridge police and the Middlesex District Attorney’s office confirmed a MIT campus police officer was shot dead after responding to a report of a disturbance when he was fired upon multiple times. Si Robertson is married to Christine. Si Robertson's wife to feature Duck Dynasty Season 4?